Charles E. Eagelton, 91, of Little Silver passed away on September 14, 2018 in Red Bank. He was born in the Bronx to the late Charles E. and Helen (McDermott) Eagleton. 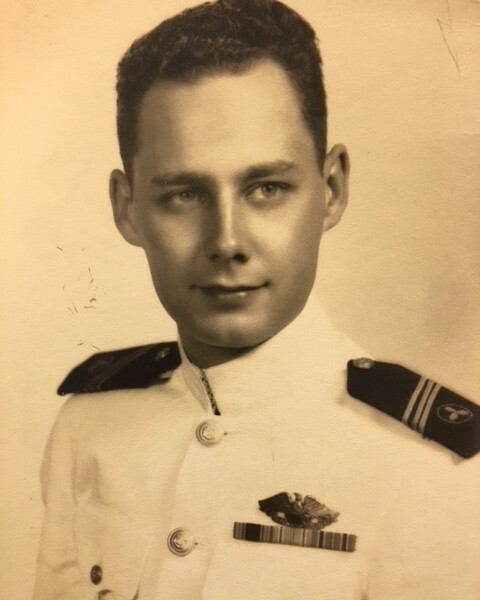 Charles served our country in the U.S. Navy during WWII, and then he earned his engineering degree from Kings Point. He was an engineer for National Starch Chemical Corporation in Bridgewater. Charles was a communicant of St. James Church; he was a scout master; he loved to play football, golf and hunt but most of all loved his family. Charles was predeceased by his beloved wife Marilyn in 2014, and his sister Pat Otto. He is survived by his loving children Kent Eagelton, Scott Eagelton and Cheryl Stavola. Also surviving is his brother Alan Cunningham; his 10 grandchildren and 6 great grandchildren. Visitation will be held at John E. Day Funeral Home, 85 Riverside Ave on Monday, September 17, 2018 from 4PM to 8PM. A Mass of Christian Burial will be held at St. James R.C. Church on Tuesday, September 18, 2018 at 11:15AM with a burial to follow at Mt. Olivet Cemetery in Middletown. Wounded Warrior Project, PO Box 758517, Topeka, KS 66675-8517.